This message was originally published 9/22/05 back when I was also writing for the original Slice of Laodicea. If you are relatively new to the Internet part of my ministries in Christ then it is going to be just a little different than you might be accustomed to reading from me. But then again, you may also have become quite aware by now, that I am just a little bit different anyway. Alright—so I’m a lot different! However as Christians, we should be unusual. In fact, if you read 1 Peter 2:9 in the King James Version it says — But ye are…a peculiar people. Truly it seems as if Jesus is drawing here to Apprising Ministries some of His most peculiar people! ;) However, I don’t mind; as the comedian once said: “I live in my own little world; but it’s ok, because they know me there.” And it really is kind of like this for the Christian because our Lord has chosen us out of this world. Though for now we remain here physically, for those of us who truly belong to the Lord — our citizenship is in heaven, and from it we await a Savior, the Lord Jesus Christ (Philippians 3:20). I knew a young man in Germany named Wolfgang who modeled [this] principle at a building site where he worked. As an enthusiastic believer [in Christ], Wolfgang always read his Bible during lunch. Though his fellow workers jeered, he didn’t stop his daily reading. He simply prayed for a way to demonstrate [the love of Jesus of Nazareth] to them. When the worker went home at night, they always left their muddy boots behind. [So] Wolfgang began staying late after work to clean their boots. The men were puzzled at first [about how their boots had become clean each day] but [they] realized that Wolfgang was the only one among them who would perform this humble service. Not only did they come to respect him, but sometimes they even asked him to read the Bible to them. Only eternity will reveal the full effect of Wolfgang’s shining life. But this we know: When his co-workers saw his good works, they [then] started listening to his God. Jesus said — Let your light so shine before men, that they may see your good works and glorify your Father in Heaven — Matthew 5:16 (NKJV). And the Bible further teaches — For we are his workmanship, created in Christ Jesus for good works, which God prepared beforehand, that we should walk in them (Ephesians 2:10). Yoder then concluded — “If you long to lead people around you to Jesus [then] radiate His love by doing practical deeds for God’s glory alone.” This is actually part of the good works we can do because of our belief in the Gospel; repentance and forgiveness of sins in Jesus’ Name. Christ already has done everything for us and now He works through us. As it is written — for it is God who works in you, both to will and to work for his good pleasure (Philippians 2:13). This is the most important reason why God leaves us here as aliens and strangers in this world, when our citizenship is actually in Heaven. We are here to be witnesses for Him and to actively lead others to Christ when they see the reality of His presence in our lives. All of the above now leads me to something that I want to bring to your attention. Of course we preach the Gospel — For I am not ashamed of the gospel, for it is the power of God for salvation to everyone who believes (Romans 1:16). However, along with this, wherever the Lord has called you to serve Him during this time of rapidly accelerating apostasy—as the skies grow ever more threatening—I exhort you to begin seriously seeking the Lord about possible ways where you can begin outreach into your community. Kind of like the way our brother Wolfgang did with the unbelievers at his building site. Then people around you also get to see the reality of Christ in action through us. The Master would like His Body to begin more actively showing our faith in Him to those we come into contact with, and to let the Lord use us as His vessels by getting more actively involved living out what we profess to believe. This really is nothing new; and it’s not the social gospel because to accomplish this we don’t need to abandon proper Biblical doctrine and follow dreamers in the Emerging Church rebellion against the Bible, nor do we need to be led by new breed people-pleasing Seeker Driven evangelicals. As we begin letting Jesus help us to properly live out our faith we will then be able to see God more visibly demonstrate the absolute Truth of our Risen Lord through each of our lives out into our communities in which He has chosen to place us. As the Bible says – Little children, let us not love in word or talk but in deed and in truth (1 John 3:18). And again — But be doers of the word, and not hearers only, deceiving yourselves (James 1:22). Beloved, now is the time—now, more than ever! Let each of us begin to pray seriously, and in earnest, that Jesus will make His true Body of Christ more like the German brother referenced above. 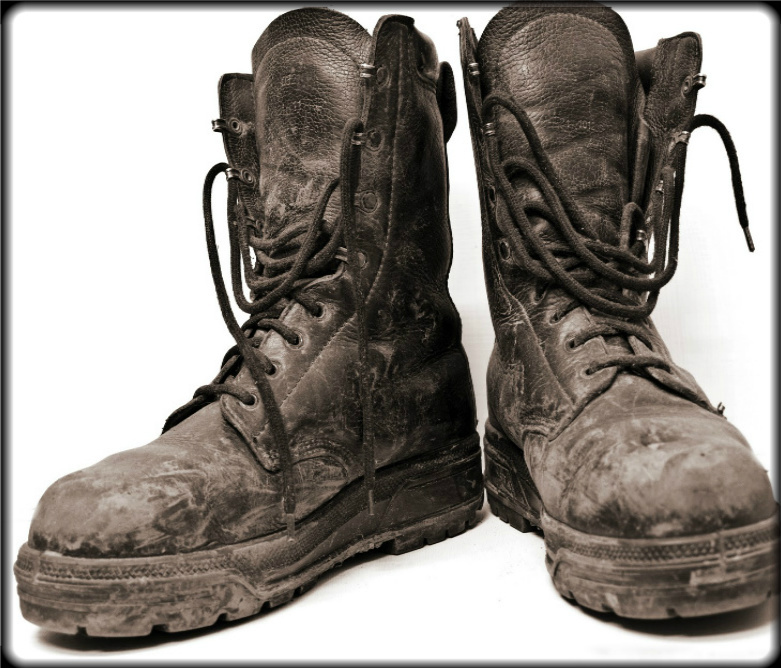 We need to ask our God—Who knows everything—just what each of us might do; individually, as well as the Church of Jesus Christ around the world, to “clean the muddy boots” as it were of those in the communities which our God determined beforehand that we should live. This isn’t pietistic legalism; it is the secondary aspect of the Gospel. Remember now, we are not where we are by coincidence. You may very well already be doing what it is God would have you do. Even so, it never hurts to ask our Master: “What do You think we should do, and what can we do?” And then as He shows you, be willing to follow wherever God leads you; no matter what, to the end. May we remember what Jesus has already told His Church — let your light shine before others, so that they may see your good works and give glory to your Father who is in heaven (Matthew 5:16). Now surely it is God’s will to use His people to bless others so that they may come to know Him through Jesus Christ our Lord. After all, we are His Body. Have you stopped to think about that lately? Do you realize that when Jesus wants to hug someone He really does use our arms at times? When He wants to tell someone, for whom He died, that He loves them—often it truly is our voice that speaks for Jesus. Many times when God wants to do something nice for someone, it is us who must answer the call to go. Yes, Jesus did everything for us; however, in these opportunities of service that will naturally come about, we’re given the honor to share Jesus with others. So does this idea of being a “witness” for Jesus come a bit more alive for you now? Just think about it though; if you aren’t in contact with unbelievers, then there will be no chance whatsoever to lead them to Christ. Make sense. Not to worry however, there’s no reason to feel that you can’t come up with any ideas for service—or that you couldn’t do these kinds of things—because the Bible says that our God is — able to do far more abundantly than all that we ask or think, according to the power at work within us (Ephesians 3:20). Even though Christ freely gives us all things, there is something in our asking in prayer as He leads. As the time grows short in this Age of Grace, and because lawlessness will be increased, the love of many will grow cold (Matthew 24:12), the Lord wants us to begin to lean on His strength to fight through this time of spiritual lethargy and to go further into His Holy Scriptures. So let’s keep all of this in mind as we seek God’s will as to how each of us can be Cleaning Muddy Boots around us. Most of us who have been Christians for a while now know from experience that the Lord delights in revealing to His children—who follow Him to make the effort to seek Him—what our God wishes us to be doing because He wants to share His joy with us as His will is accomplished on earth as it is in Heaven (Matthew 6:10) And I must be straightforward with you as I tell you; yes, it does require some effort on the part of the Christian. This is not to confuse Law and Gospel; there’s nothing we can add to what God in Christ has done, I’m speaking of the working out of our salvation (Philippians 2:12). Beloved, let us marvel and wonder at what we have just read. Those of us called out of the world—through no merit of our own—to worship our Lord can come to see the absolutely amazing truth that God – He rewards those who seek Him! Soli Deo Gloria!